The Kleiner Panzerbefehlswagen is a variant of the German Panzer 1. 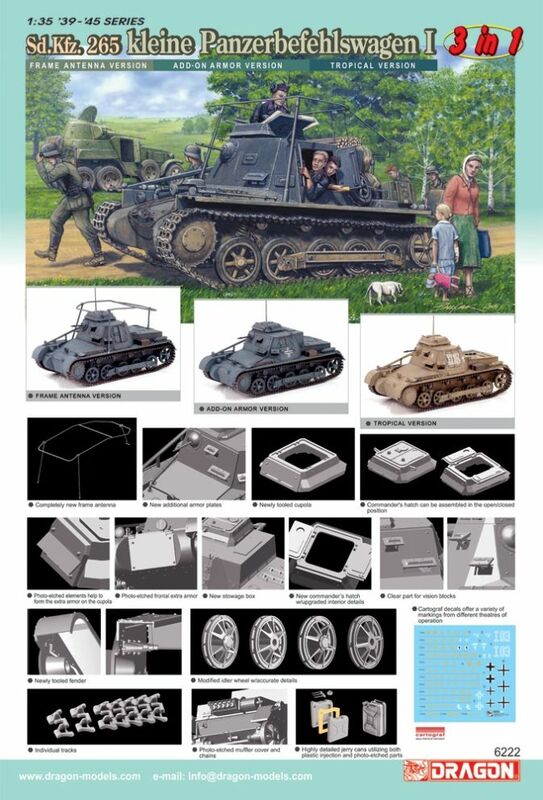 This kit features 3 different versions of this tank. The Kleiner Panzerbefehlswagen is a variant of the German Panzer 1. The Panzer I was a tank produced by Nazi Germany in the 1930s, intended as a training tank, but also used extensively in the Spanish Civil War and early World War II. It served as the basis for the Pzkpfw II; other vehicles based on the chassis included self-propelled guns and antiaircraft artillery. The Kleiner Panzerbefehlswagen (SdKfz 265) was a Command tank, with fixed 14.5 mm armoured superstructure, single machinegun and extra radios for control of armoured operations. 190 to 200 were converted from mainly Ausf B, some Ausf A Panzer 1's.